dream of, and visualize, a wondrous new world that is kind, caring, and prosperous. Dratzo! As the world continues to change, the cabal remains deeply perturbed at losing their grip on humanity. You have had a long struggle of ups and downs and yet your resolve to hold the Light is ever present. Most beings on your planet sense beneficial change on some level. The world you have known for centuries is in a state of collapse. The current global scene is running its course. Hot on its trail are events that promise to be quite life-changing. They involve the birth of a new era of true spiritual growth and the emergence of long-sought ideals such as peace, prosperity, and personal sovereignty. We now find ourselves in an interregnum, watching as the old Dark Age dissolves and a new era of hope and renewal comes into view. For those of you who follow world events, you are witnessing a time when all of the puzzle pieces are falling into place. A clear plan and timetable have been set up. What we require of you now is to wait patiently while a number of seemingly unrelated events occur, unraveling the dark’s agenda and replacing it with one in alignment with the Divine Plan. The Alliance has implemented a plan that is fluid. This specially- constructed, ‘infinite-sum game’ and its accompanying quantum solutions, are providing our Earth allies their advantage over the static cabal strategies. Let us turn our attention in this message to an aspect that parallels your prosperity, the heavenly preparation of your physical self for full consciousness. This process entails a complete redoing of your physical, mental and emotional bodies. Final reintegration is to occur while you are safely inside a crystalline Light chamber. This special living compartment of Light is to fashion a complete re-sequencing of your cellular RNA/DNA. It works as a dynamic Light instrument, according to each individual’s particular requirements and orchestrates new sequencing codes that move you instantly toward achieving your full physical potential. Designed by Heaven, this process will take approximately three Earth days to achieve its divine goals. Your own body guardians and your other heavenly guides are to direct it. Once you emerge from this living crystal of Light, you are to be returned to full consciousness. Full consciousness is the divine goal. The Creator decrees that your reality is to return to a fully conscious one. The reality you know now is rapidly becoming something quite alien. We witness these events taking place before our very eyes and closely observe the galaxy shifting back into a unified, multi-dimensional state. The frequencies showering your planet are vast energy waves that reorder the energy fields that intertwine space and time. As this reweaving progresses, the galaxy manifests her beauty in a suffusion of luminous color and breath-taking shapes. Glory be!!! Blessings! We are your Ascended Masters! The time is coming when a new era of peace and enlightenment is to shower Mother Earth! This new reality is beginning to manifest in many blessed ways. 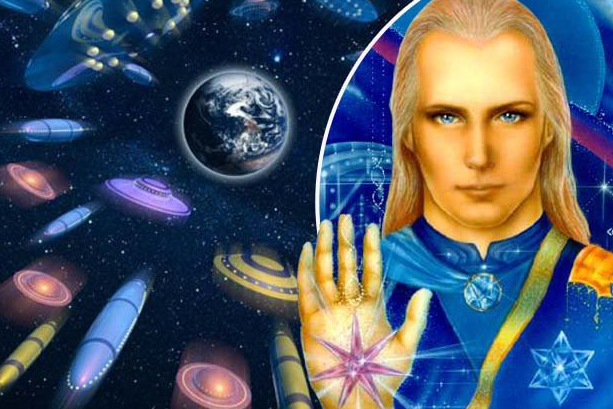 It is this glorious new reality that allows us to move humanity forward into a new Galactic age! As we become more able to understand how this realm is changing, we learn new ways to spiritually address each other. What we ask of you now is to dream of, and visualize, a wondrous new world that is kind, caring, and prosperous. Your ever-growing consciousness is redefining how you see each other and how new realities are being added to your perceptions of the world. For centuries, we have observed the Light of transformation grow stronger and stronger, causing the dark ones to grudgingly retreat. This new reality is beginning to manifest in myriad blessed ways. Each day we watch as your planet becomes energetically more magnificent. As the old reality’s grids collapse, we can see glowing streaks of light and fantastic cloud formations appearing suddenly in the sky for all to witness. Your reality is soon to expand and remake itself. We will be your divine guides and spiritually-appointed mentors, and we take this privileged role very seriously. We are grateful to our space family for visiting us in ever-greater numbers and we rejoice that the Light of Heaven is pouring down all around us. We are also greatly pleased to know that increasing numbers of you all over your world are sending us daily prayers of Love. Each of you possesses the prime quality of saintliness, which has been suppressed ever since the dark ‘reset’ this reality nearly 13 millennia ago. The time approaches for you all to transform and become physical Angels once more! Together, we are to create an urgently-needed new star nation and fulfill the Creator’s most sublime and ardent dreams. A time for miracles and wonder is on its way!